The forecast has verified pretty well, with a high concentration of tornado reports across central to east central Missouri and west central Illinois. Unfortunately, three more people have died in Missouri (central Missouri, near Rolla) as a result of one of these tornadoes. Several other tornadoes caused damage in the St. Louis area and over parts of west central Illinois. As outlined yesterday, this setup was not ideal. 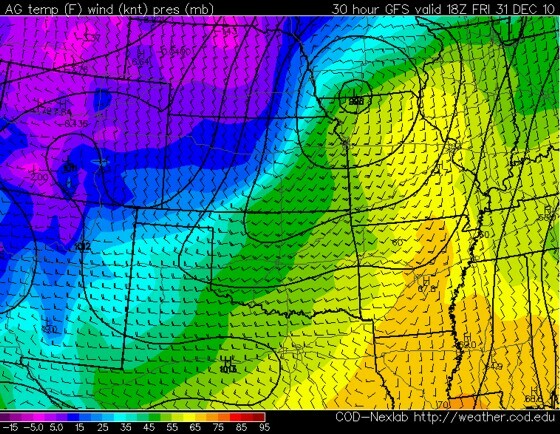 Low level moisture was on the marginal side and so was instability (CAPE). There was also a relatively small window of opportunity for these storms to produce tornadoes before the system turned into a linear squall line. 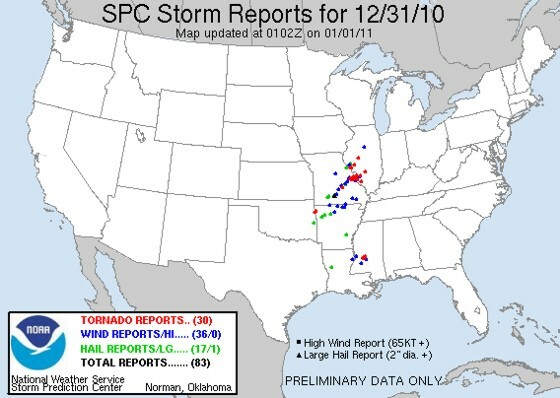 Yet, there are 20 tornado reports in Missouri and Illinois combined, (with 8 reports in southern Mississippi http://www.wlbt.com/Global/story.asp?S=13766768 ). I can’t even imagine what kind of a huge outbreak this would have been if conditions had been just a tad better in terms of moisture and instability. Let’s be glad they were not. These storms were moving northeast between 55 and 60 mph, and warning lead times were pretty small. Confirmed tornado kills 3 in northwestern Arkansas this morning. There isn’t much to say, really. It’s just terrible when lives are lost from tornadoes. Hopefully residents in the St. Louis area found shelter before the tornado(s) over there moved through. A tornado has already been reported in far northwestern Arkansas. A couple supercells are ongoing over northwestern Arkansas extending into southwestern Missouri. But more storms/supercells are expected to develop further north and east into central/eastern Missouri over the next few hours. Some of he storms along the developing squall line over western Missouri extending into central Missouri over the next couple hours may even become supercellular at times at times, posing a tornado threat, as the wind shear increases. The ideas outlined yesterday look pretty good. But, the northern extent of the target area looks cut off now by a faster moving cold front and convective debris. Nevertheless, I still like the area near I-70 in central Missouri. Though I would extend that taret area further south and still stretch it into extreme west central Illinois over the next few hours into early this afternoon. With the Northeast blizzard still fresh on my mind (and many others I’m sure), it’s nice to see a severe weather setup with low topped supercells possible tomorrow afternoon (New Years Eve). 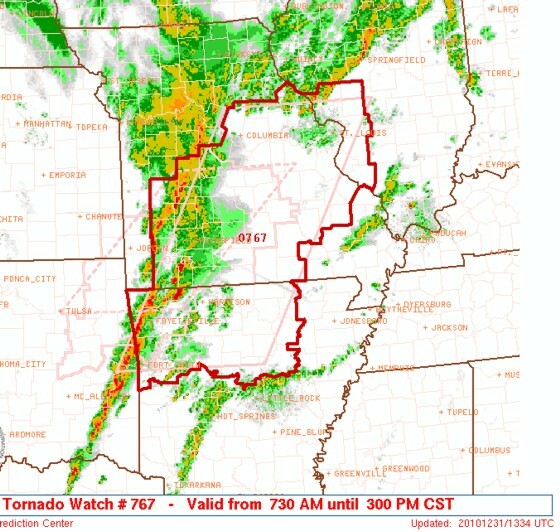 The region I’m interested in stretches from northern Missouri and west central Illinois south into central Arkansas. But the two areas of focus IMO are 1)north central to northeastern Missouri and 2)central to eastern Arkansas. 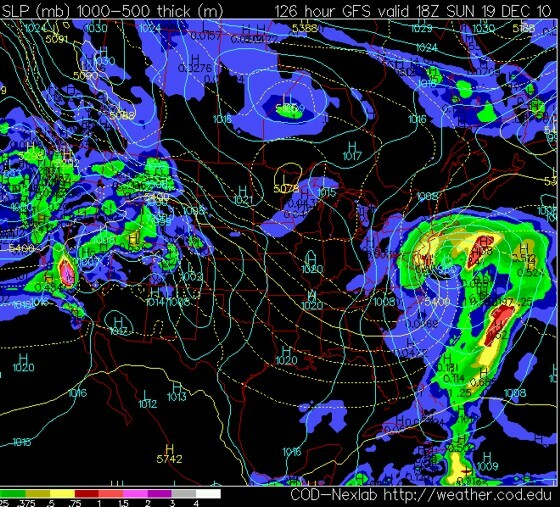 Below you can see the GFS forecast surface map for midday Friday (Dec 31). Low pressure is located over northwestern Missouri with a dryline/pre-frontal trough mixture stretching southward from west central Missouri into central Arkansas. This will be the primary focus mechanism for thunderstorms beginning midday Friday throughout the afternoon, as the boundary rapidly propagates east into the evening hours. The surface low pressure will be associated with a very fast and intense upper trough moving very quickly through the mid Mississippi Valley. Below you can see the 500 mb wind/height forecast from the GFS for midday tomorrow. Notice how 500 mb winds are generally out of the southwest/south-southwest from around 70 knots in Arkansas to 90 knots in Missouri! Immediately the 90 knots in Missouri catches my attention as they provide incredible 0-6 km speed shear, which will be helpful in generating severe thunderstorms, possibly supercells, if other factors are present. The next image (below) is the 850 mb heights/winds from the GFS for midday Friday. Notice winds are a bit stronger (50 knots) and more backed across much of central to northern Missouri. 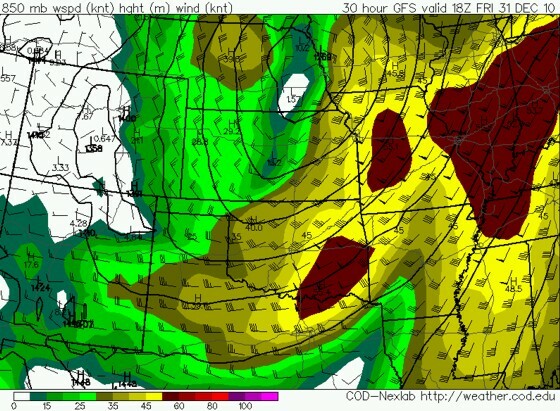 Meanwhile winds are a bit more veered and not quite as strong (35-45 knots) across central Arkansas. The disparity is because the surface low is located further north across northwestern Missouri, and it is rapidly moving northeast with the upper trough. So now we know there is more 0-6 km speed shear across Missouri and it looks like the 850mb flow is more conducive for supercell development in Missouri — especially north central Missouri — vs. central to eastern Arkansas. Finally, lets take a look at how much instability is forecast for tomorrow across both regions of interest. According to the GFS, mid 50s surface dewpoints should be in place by midday tomorrow as far north as northern Missouri, while lower 60s dewpoints are expected across much of central to eastern Arkansas. Immediately Arkansas does look more favorable from a moisture standpoint, and that does (at first glance) look like one of the main inhibiting factors for the north central Missouri region tomorrow. However, one good thing going for Missouri is 500 mb temperatures will be lower given the closer proximity to the upper trough, helping to boost instability despite the somewhat limited low level moisture. Given those circumstances, take a look at the GFS CAPE forecast for midday tomorrow (below). Sure enough, there is a 750 j/kg CAPE maximum over north central/northeastern Missouri, likely due to a combination of cold air aloft and adequate surface dewpoints. In Arkansas, you have to head into the southern part of the state before you reach the 750 j/kg of CAPE. Now let me clarify. 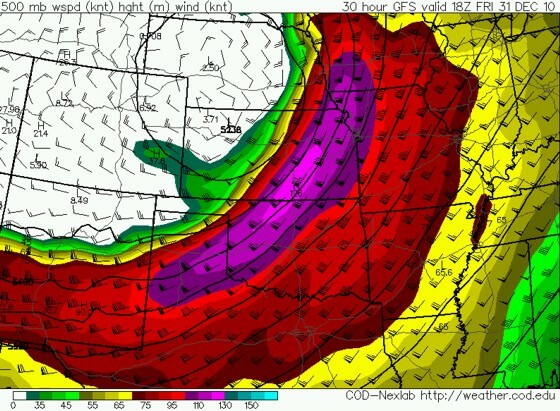 In typical spring setup you need a good 1500 j/kg to 2000 j/kg or more CAPE to support supercells. But this setup is unique in that more dynamics are in place and the wind shear is so extreme it is compensating for quite low CAPE values. This is not a great setup, and factors will only be present for severe storms during a short window midday tomorrow into the early afternoon hours across north central Missouri extending quickly into extreme west central Illinois. I think if things come together just right, severe storms will develop around 1 pm near I-70 in north central Missouri along the dryline/pre-frontal trough. If enough instability is present (this will depend on how well early morning convective debris is able to erode and move east of the area) and the GFS is correct in forecasting 850 mb winds out of the south-southwest near 50 knots at 18z, then I think low topped supercells will develop and move rapidly north-northeast. Given the high degree of 0-6 km speed shear and the combination of speed and directional shear in the lowest levels, some tornadoes will be possible in this region. Furthermore, surface temperatures may only reach the upper 50s to lower 60s. This means cloud bases will be pretty low, further enhancing the tornado potential. But this will all occur within a 3-4 hour window, maybe even less, and storms will be moving north-northeast at greater than 50 mph. In other words, good luck chasing them! Further south across Arkansas the conditions are not that much different than in Missouri, but enough to make a difference. Given the further distance form the surface low, low level wind fields due appear to be more veered in general, which will hurt the tornado potential. The instability will also be a bit lower given the warmer temperatures aloft. Severe storms are still likely across central to eastern Arkansas, some of which will also be low-topped supercells. But If I had to choose a chase target, I’d pick north central Missouri into extreme western Illinois. Again, this whole setup is mediocre. But for new years eve, it’s not too bad. Happy new year! While it may sound like a cliche, a Christmas miracle is about to happen for all the weather enthusiasts across the Northeast. 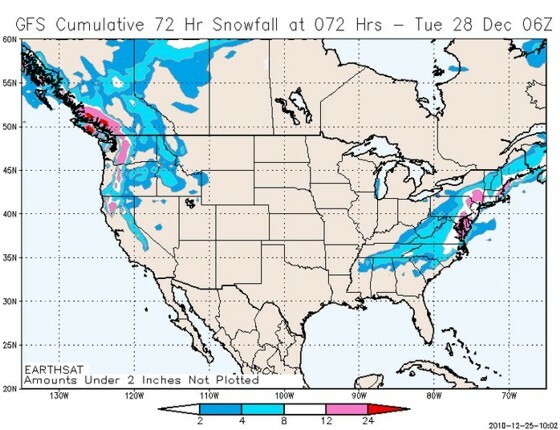 On Christmas Eve, all the computer models suddenly shifted their track of the intense low pressure system off the East coast for tomorrow further west — closer to the Northeast coast. This is of course after a week of hit and miss amongst the various models (except the European for quite a few days), much like the storm system from last weekend that looked like a potentially big system until just a couple days before the storm was expected to hit. But the big difference with this upcoming system is models are now converging on a solution as we hit the 36 hour forecast window. That solution calls for blizzard conditions tomorrow night across the Northeast coast, with winds sustained in the 25 to 35 mph range and higher gusts. And if you don’t believe me, check out your local NWS forecasts. 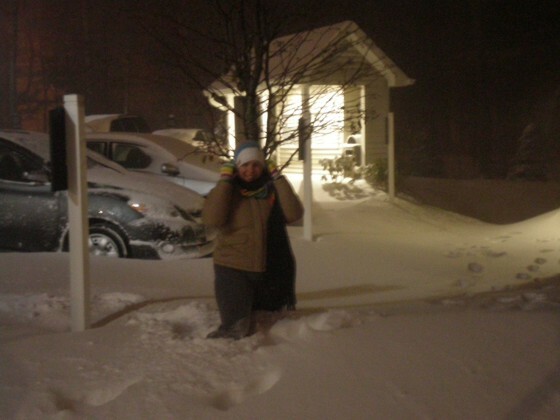 These meteorologists are seeing a big storm and forecasting one. The data finally supports it. It’s happening. 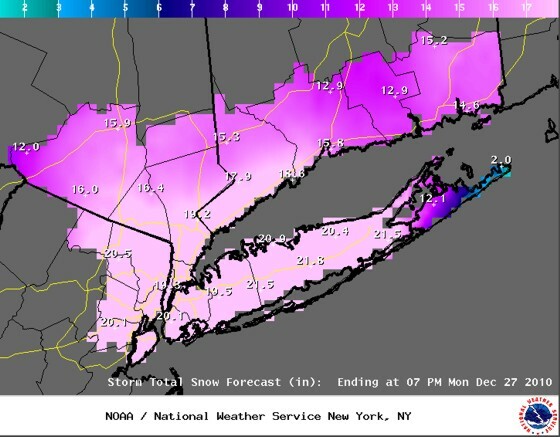 Depending on the exact track of the system itself, many areas along the I-95 corridor from NYC to BOS should receive up to a foot of snow, with some locations receiving up to 16 inches. This heavy band of snow will also extend well into central New England, reaching southern VT, NH and much of coastal Maine. But what’s really interesting is some locally higher snow amounts are possible. It will really come down to exactly how close to the coast the low pressure system actually tracks and how much it deepens Sunday night as it lifts north-northeast into the Gulf of Maine. Tonight’s computer models will help to iron out those details. It’s been an interesting learning experience to say the least. 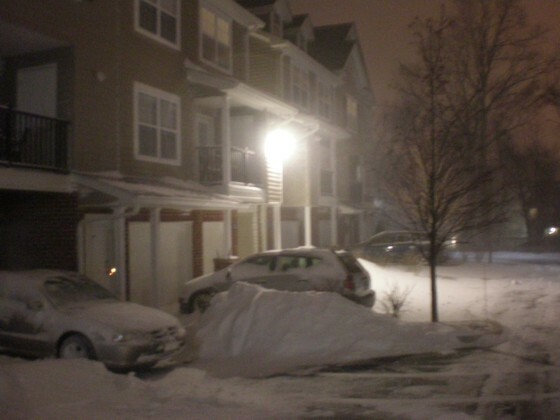 The normally very reliable European Operational model had been forecasting this blizzard many days in advance. And it showed amazing consistency until the 12z Thursday (Dec 23) run, when it finally shifted the track of the low pressure system well to the east, showing another big miss for the Northeast coast. At that time it really looked like it wasn’t going to happen. Many meteorologists were throwing in the towel, finally surrendering to yet another big forecast bust. 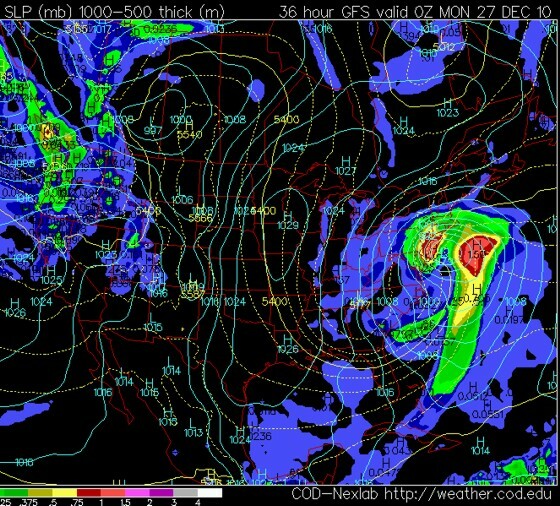 Then the tables turned on Christmas Eve, and we have ourselves a blizzard coming to the Northeast tomorrow night. But this turn of events has been a bit of a surprise for most meteorologists for good reasons. The battle between La Nina and high latitude blocking has created chaos between the computer models as early as three days out in the forecast period. 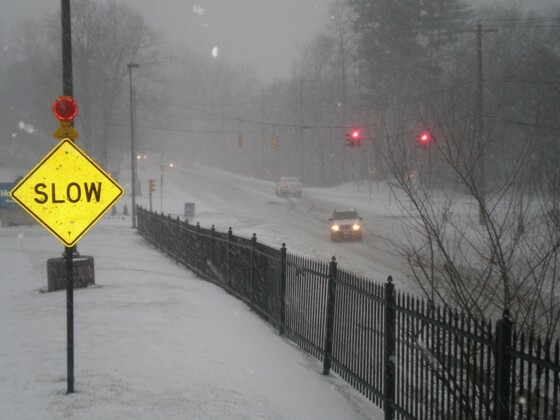 This has been the case for the last few weeks, causing big forecast surprises both in the short and long term across many portions of the U.S. But I can’t be mad about this forecast shift. It’s working in my favor. 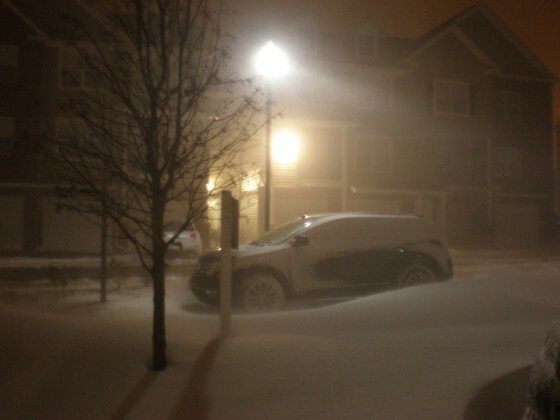 I love the snow, and especially love getting hammered with as big of a snowstorm as possible! 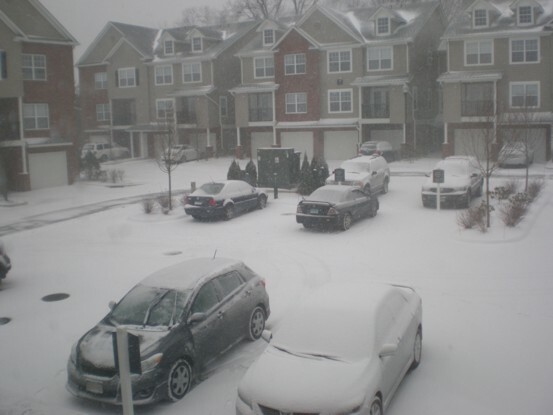 Growing up in Nashville, TN, I never really saw that much snow. 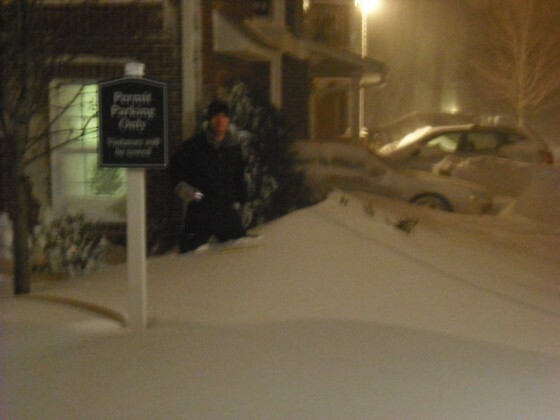 Then attending college in Norman, Oklahoma, I remember we received 9 inches of snow during a January snowstorm. But that was pretty much the best I ever experienced in an area in which I lived. 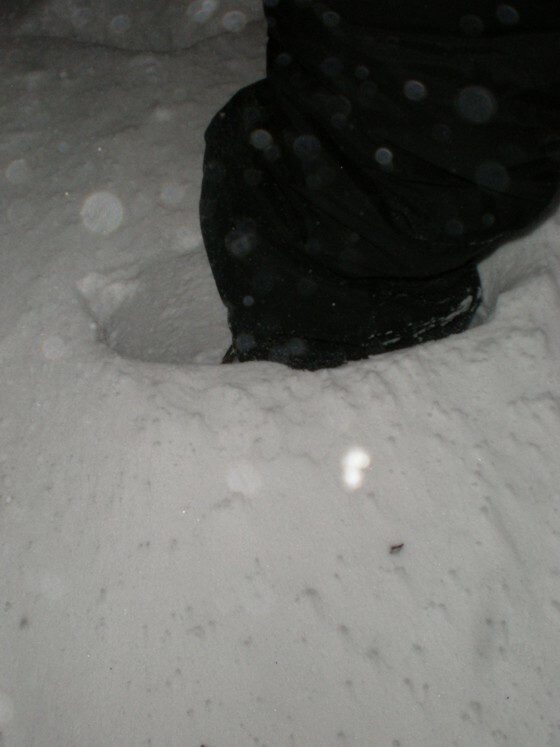 Even living up here in CT, I still haven’t seen more than six or seven inches of snow in my backyard during any one event. So, it certainly looks like this will be one for the books, at least for me. 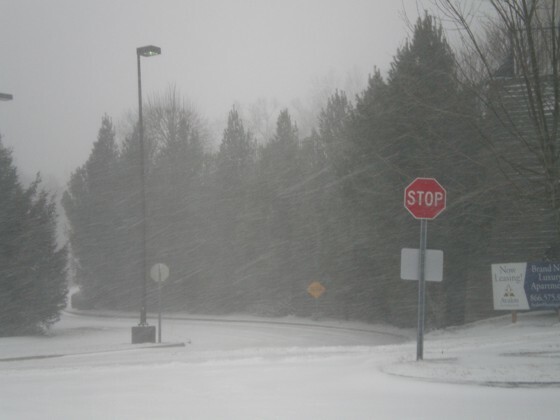 Others in CT and all over the Northeast will remember this as another one of those Christmas time blizzards that dampened their travel plans or activities before the new year. Cloudy skies ruin total lunar eclipse viewing for many in the U.S.
Total Lunar Eclipse only visible to some across the U.S. I woke up this morning at 2:40 a.m., anxious to view my first total lunar eclipse, which was also suppose to be one of the more rare ones of my generation. 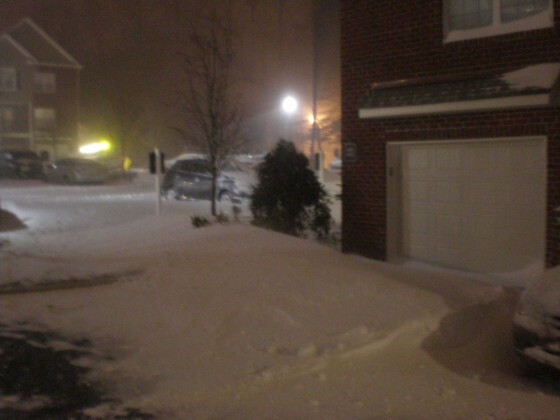 I put on several layers of clothing and grabbed my camera equipment that I had set out last night, ready to go. MaryLeigh and I put our shoes on and walked outside into the freezing cold and high winds only to see no stars and no moon. The sky had a blanket of clouds covering up what would be a magnificent lunar eclipse. What a cruel joke mother nature! It turns out the storm system that failed to bring snow to most of the Northeast late this past weekend was still spinning well out at sea, and brought a batch of high level clouds overhead that none of the computer models were forecasting for this morning! 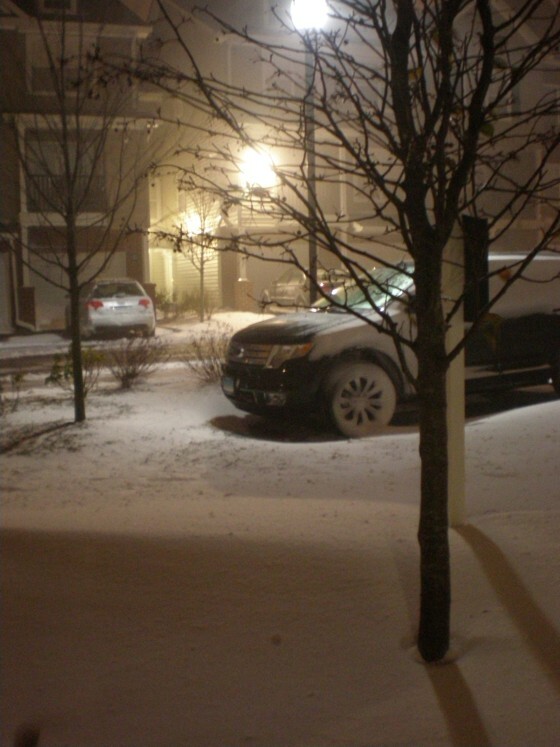 Even the local NWS forecast called for mostly clear skies. And the ironic part about all of this is the clouds didn’t show up until right before the eclipse began! I guess the one positive that came out of this morning is my wife and I did take out a bunch of trash to the dumpster, even though we were literally freezing our tails off! In a clumsy attempt to grab a box from my wife to carry more of the load, I accidentally smacked her in the face with it. Woops! But we were not the only ones who were robbed of their eclipse viewing experience. 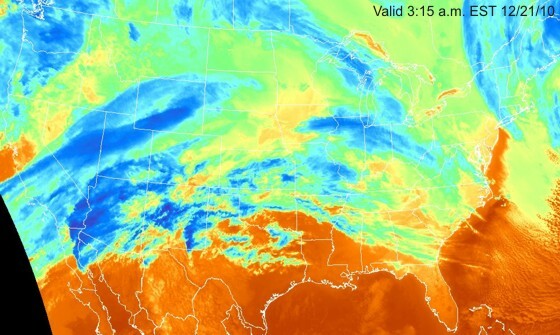 A quick glance at the infrared satellite image from 3:15 a.m. EST (below) shows why. Notice that not only was all of New England under a massive cirrus deck, but much of the Southeast, Midwest, Plains and interior West were also covered with clouds from various storm systems across the country. It looks like the Gulf coast, parts of Texas and Oklahoma, the northern Plains and patches of the interior West and Great Lakes were the only regions that had a view of the eclipse. Not that many areas had great viewing conditions for such a spectacular event. Much of the U.S. was covered with clouds early this morning, spoiling the eclipse view for many. But, certainly the ‘best’ viewing was across parts of Oklahoma, Texas and the Gulf coast. Luckily, Simon was in Oklahoma early this morning on his way back from Ohio. He set up his camera equipment in a field near Wynnewood, OK where cloud cover was not an issue. He captured some magnificent shots of this historic lunar eclipse. 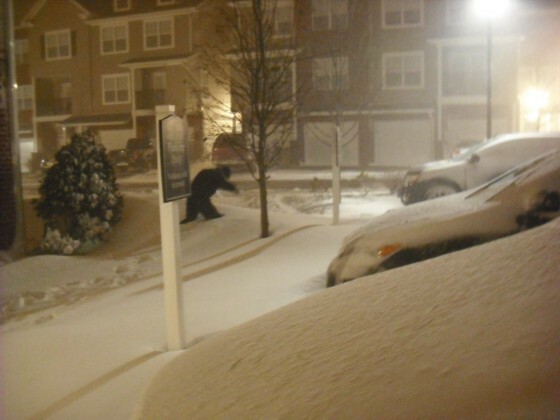 One of his photos is seen at the beginning of this blog post, and more can be found on the eclipse page of Stormgasm.com. 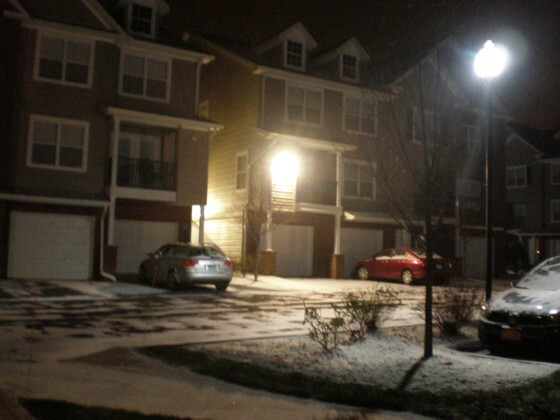 It’s actually really pathetic, but my area in Connecticut finally saw a dusting of snow this morning. 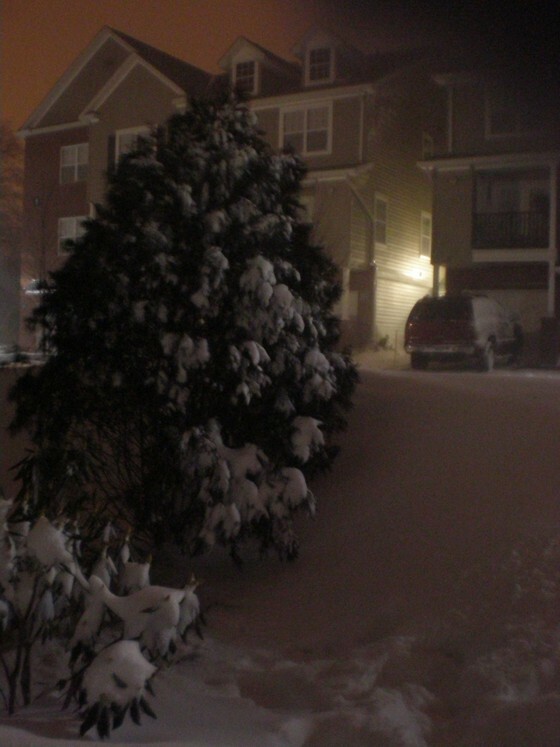 Sure, it fell after all of the Midwest and mid South saw way more snow than I (including my hometown in middle TN), but it’s still the first snow of the season for me here in Shelton, CT. Hopefully, the potential mega-storm for Sunday will pan out and I’ll have GOOD pictures to share with all of you. 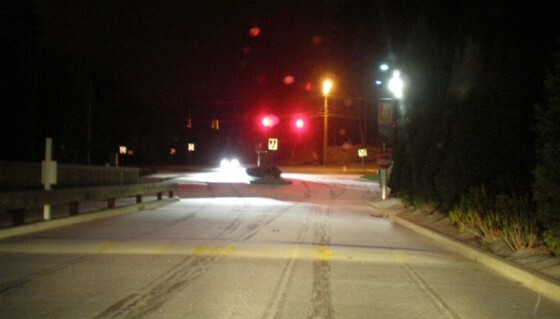 Until then, enjoy these sub-par photos I took quickly early this morning on the way to work….As a side note my wife says the snow looked a LOT better about an hour after I took these pictures. 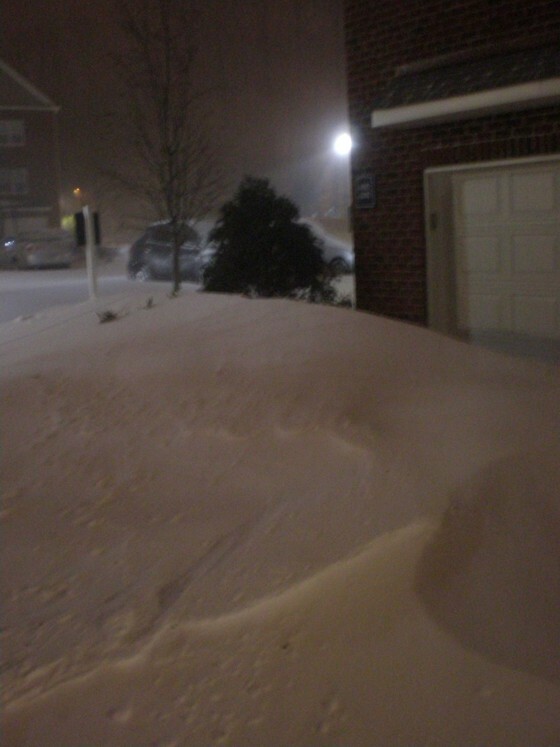 However, I guess she didn’t feel like going outside to take a few photos. Who can really blame her, there still wasn’t much to see. 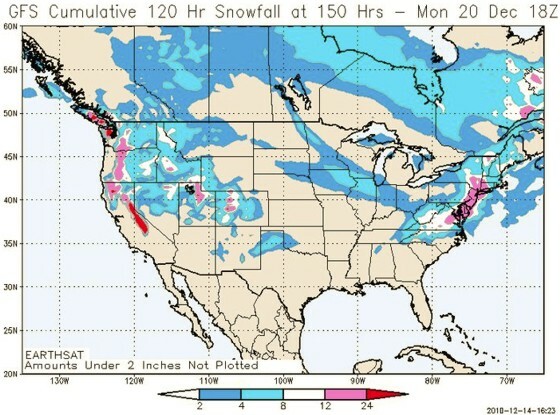 According to the 12z GFS model from 12/14, the Northeast is going to get hammered by a major snowstorm (Nor’easter) on Sunday and Monday, December 19 and 20, from the D.C. area all with up to Boston! 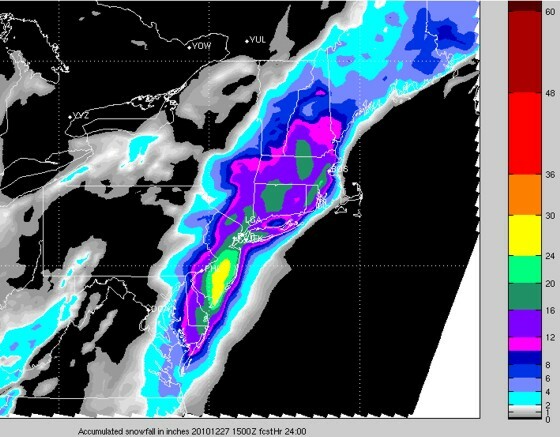 It shows a foot of snowfall from Maryland to NYC! The European model showed a mega storm like this a couple times this past weekend, but has since backed off. In fact, the European and Canadian models alike both track this intense storm system well east of the coast, keeping the Mid Atlantic and Northeast snow-free. But it’s too early to make any definitive calls. The potential event is still several days away, and ensemble members don’t track the storm system THAT far away from the coast. All it would take is a west trend and some more jet stream phasing and we could have ourselves a heavy snow event to deal with across the coastal Northeast late this weekend.